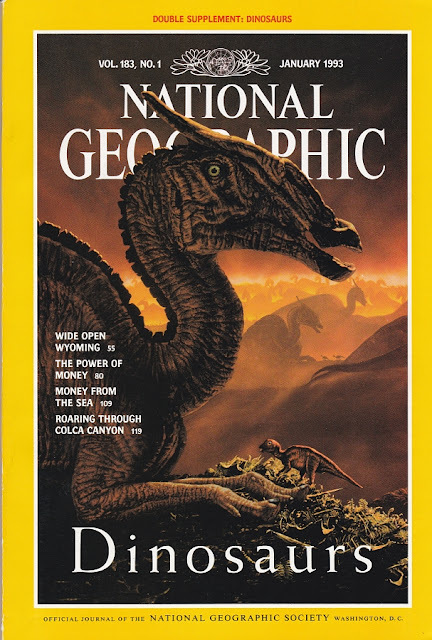 The last time I looked at an old issue of National Geographic, it was from 1978, when the ideas put forward in the Dinosaur Renaissance were starting to take hold in the popular imagination. Fifteen years later, and Vol. 183, No. 1 shows just how much progress had been made. What's especially fascinating about this issue of Nat Geo is that it not only looks at the current state of the science, but also how dinosaurs were enjoying a resurgence in popularity among the general public at the time, in turn offering an insight into contemporary trends in palaeoart. Which means John Gurche. Lots of John Gurche. Dinosaur Hearts button sets now available! 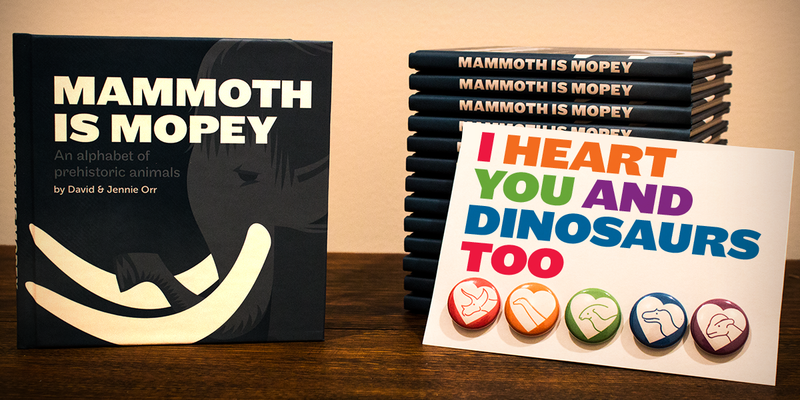 Over at the Mammoth is Mopey website, we're running a promotion through Valentine's Day. Every book comes with a free set of five "Dinosaur Heart" buttons, mounted on a glossy "I Heart You and Dinosaurs Too" Valentine card. If you already own the book but would still like to pick up a button set, not to worry. They're available separately, as well! Jennie and I assemble every set ourselves, and they look terrific, if I do say so myself. If you'd like to place an order for Valentine's day, international orders should be placed by January 31 and domestic (U.S) orders by February 9. In this guest post, we hand the microphone to Daniel Bensen, who is here to bring a novelist's perspective to the topic of accuracy in media portrayals of extinct animals. Let's talk about the giant lizards in Jurassic World. Their tails droop like noodles, their skins are scaly and wrinkled, hanging off prominent bones. Their hands curl in front of them as if ready to dribble basketballs. They hiss and spit, and glare at the world through slit-pupiled eyes, their skulls as bony and gnarled as dragons'. Jurassic World's lizards are scary. They're distinctive (and copyrightable) on the screen and in toy stores. They're lucrative as hell. And they're wrong. They are less similar to real Velociraptor than the ones in the original Jurassic Park movie 20 years ago. Universal Studios had a good reason for using giant lizards rather than real dinosaurs in Jurassic World. 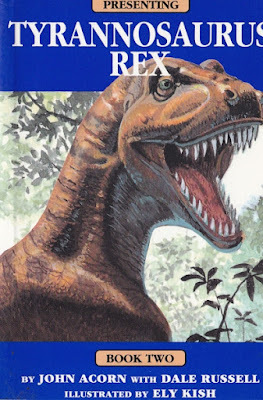 They didn't want to make just any old dinosaur movie, they wanted to continue the Jurassic Park franchise, and Jurassic Park raptors look like this. If the special effects people made raptors that look like that, they would have been off-brand—unrecognizable to the public, and (since you can't copyright what a real animal looks like) terrifyingly public domain. Even worse, a real Velociraptor wouldn't have worked symbolically. The movie doesn't need a real animal. It needs a key to the lock in your brain that opens a door marked "here be dragons." If Jurassic World was called "Dragon World," that would be the end of this essay. Why not give the public what they want, after all? What does it matter what symbol we use to denote "dinosaur" in our brains? Well, none. We don't have time machines. We're not going to meet real dinosaurs, so the question of what they really looked like will only ever be academic. There is a bigger problem, though, and that's the fact that movies play just as fast and loose with real, present day reality. The angry "hey, that's not accurate!" feeling I get when I watch Jurassic World hits me at other times too. The female CIA agent who helped track down Osama Bin Laden looks like this, but in the movie based on her work, she's played by an actress who looks like this. Why did the casting director make that decision? Because Alfreda Frances Bikowsky's face doesn't press the "pretty, tough-girl" button as hard as Jessica Chastain. In The Avengers: Age of Ultron, there's a small Eastern European country where people write in Cyrillic, but speak accented English to each other. No such country comes even close to existing, but if they spoke Serbian, how could we sympathize with them? If they wrote in English, how would we know they were foreign? In Interstellar, climate change has made human life on Earth impossible, except the main character still tends crops growing in the soil under an open sky, because if he didn't, the movie wouldn't press button in our rains marked "farmer." When we watch movies, we aren't actually seeing CIA agents or Eastern European countries or climate change, any more than we're watching anything like real dinosaurs. Instead, we're seeing symbols. Except we are very bad at remembering the difference between symbols and reality. Doctor-turned-statistician Hans Rosling put together a quiz about the state of the world. Who's rich and who's poor? Who's peaceful and who's violent? What countries are better to live in than what other countries? He gave the quiz to people on the street and found that the answers they gave describe a world in which the US and a handful of western European countries huddle at the center of a vast wasteland of desperate, dangerous, funny-talking foreigners. That's a world that exists only in movies, and yet most of the people Rosling quizzed mistake it for reality. What happens when these misinformed people vote? What happens when they march off to war? We live in a complicated world, more complicated than we can probably understand. It's tempting to wallpaper over variegated reality and lump all changes, exceptions, and shades of meaning into a monolithic symbol. Young woman = pretty, Eastern Europe = war crimes, farmer = dirt, dinosaur = lizard-monster. I urge you storytellers out there to resist the temptation of symbols, however. We ignore reality at our peril; like a Velociraptor, reality is most likely to attack when you're not looking. Daniel M Bensen is an English teacher and author. His new book, Groom of the Tyrannosaur Queen, is about accurate dinosaurs and what happens when you forget that other people are real. It also has particle beams and tyrannosaur hunts and a wedding! The second best thing about the programme is that it's about bones. So many dinosaur documentaries in the last couple of decades have shied away from focussing on the bare bones, even though that's (largely) what we know Mesozoic dinosaurs from. This is a reminder that the fossils can be the stars of the show by themselves, and not just the spectacularly huge thigh bones, bigger than men, but everything down to the tiniest eggshell fragments. I've seen it mentioned that the show doesn't quite go far enough in linking modern birds with Mesozoic dinosaurs, and that's quite true. They're described as the "closest living relatives", which is true, but too little is made of their evolutionary kinship. On the other hand, I was just grateful for all the marvellous anatomical adaptations of sauropods to huge size were being carefully explained to a lay audience. 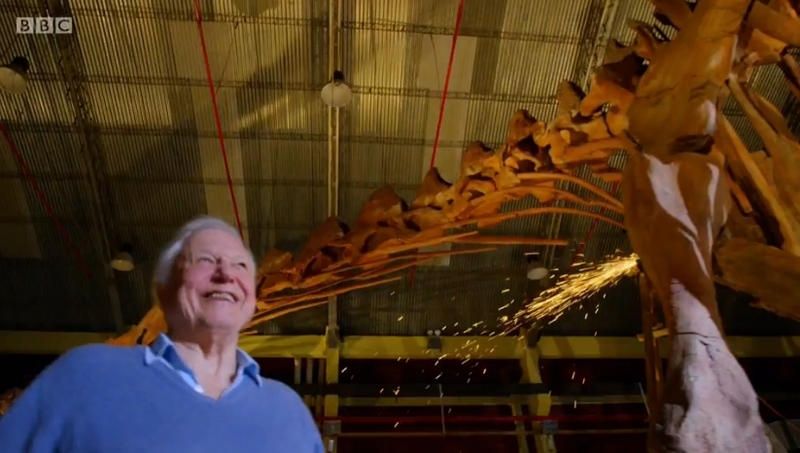 The best thing about the show, of course, was when Attenborough walked in on the fully reconstructed titanosaur skeleton in a warehouse, and grinned and giggled like a wee lad in a sweet shop. So... this was supposed to go up on December 18, and life junk kept me from wrapping it up (the intended date of publication will be meaningful in terms of some of the seeming non sequiturs in the descriptions, which I don't feel like cutting). So forgive the slightly older than usual linkage here. Still, stuff well worth checking out. I'll try to have another, fresher round-em-up soon. Been a bonkers end-of-2015 and start-of-2016, work wise. A barfed-up pterosaur! Presumably it was not digested over 10,000 years, finding a new meaning of pain and suffering. Andy Farke and Brian Switek have the rest of the story. With a name like Hensonbatrachus kermiti, think you could guess what kind of critter it was? Hint: it's not a Kowakian Monkey Lizard. Royal Tyrrell Museum has the tale. New species of ankylosaur from Australia? This deal keeps getting better all the time! Azendohsaurus had an interesting change in phylogenetic placement; more from Jaime Headden at The Bite Stuff. "You seen that new garish Velociraptor?" "Yeah, the Dino Toy Blog was telling me about it... they say it's quite a thing to see." Pixar's The Good Dinosaur came out at the end of November, and Marc Vincent and Jaime Headden offered reviews. Luis Rey took a look at a new CollectA Spinosaur which seems to be inspired by one of his recent depictions of the beast - at least in the wrist. Look mammals so old to young eyes? Guardian science blogger Elsa Panciroli examines the debate over the phylogenetic placement of the haramiyidans. Heinrich Mallison paid a visit to Juramuseum Eichstätt and how is it? Well, it's certainly no wretched hive of scum and villainy. Mark Witton followed up his first wonderful Tanystropheus article with a second, exploring what sort of lifestyle the sum total of the protorosaur's anatomy seems to add up to. 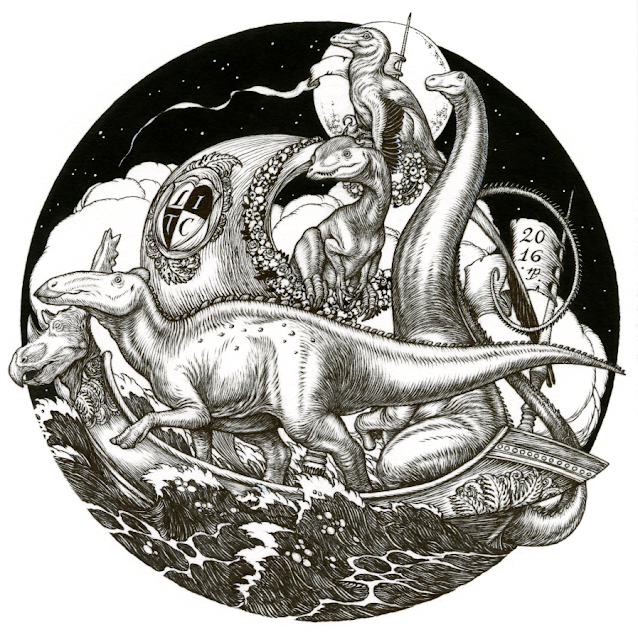 At SV-POW, Mike Taylor has written a touching personal tribute to Jack McIntosh, a legend in the study of sauropods who passed away last month at the age of 92. Abydosaurus mcintoshi and Brontomerus mcintoshi are both named in honor of Mr. McIntosh. I love Franxurio's work; I feel like we chase similar muses, but in our own ways. 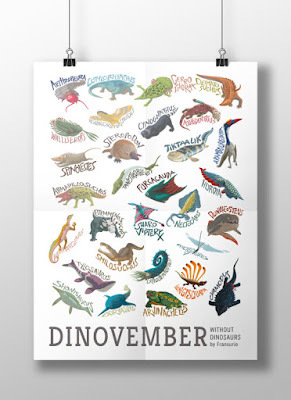 Check out this beautiful poster wrapping up his #Dinovember illustrations. Love the use of hand lettering, too. Dinovember without Dinosaurs by Franxurio, available at Redbubble. 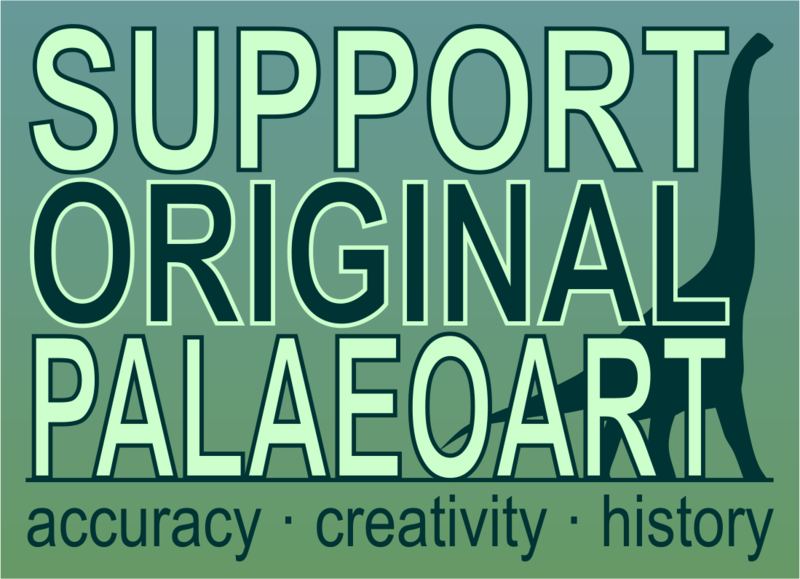 While best known for her spectacular work with Dale Russell on An Odyssey in Time, the late, great Eleanor 'Ely' Kish remained active in palaeoart throughout the '80s and into the '90s, although many of the books she illustrated are now quite obscure. This would be one of those. In fact, this was one of those cases where I saw an intriguing-looking book appear on eBay for the first time, only to obtain it and realise that I had it as a kid. Given that, it unsurprisingly concerns everyone's favourite hungry hungry horror. May I present Presenting Tyrannosaurus rex. Ink on hot pressed watercolour paper, 150 x 150 mm. A little late, but not yet too late. Happy New Year to our readers from David (Anatotitan/Edmontosaurus), Asher (Dilophosaurus), Marc (Deinonychus), and me (Diplodocus). I made very few contributions to the blog in 2015, owing largely to moving house and a number of rather personal issues, but I very much hope that this piece is a good beginning to a more fruitful year ahead (opening the image out in a new tab for a closer view is once again recommended, *cough*). Oh, and I just wanted to mention that the basis of the boat's design was purloined and adapted from an illustration by Franklin Booth. Many thanks to Marc for holding off his first VDA post of 2016 (a cracking one featuring Ely Kish once again, hurrah!) to allow me to make this 'opener', so to speak!